This one split me. I love the look, and the paper was great, but the quality control on this one was a little lacking, and the fancy "fold in" ruler was poorly designed, and in my opinion, unnecessary. Read the full review here. My absolute favorite Field Notes release this year. I love the look of the covers. They remind me of Boy Scout manuals, using color blocks and halftone art. Each pack came with a patch, which was VERY cool. Read the full review here. I like the idea, but the size wasn't for me. They did a bang-up job replicating the older Dime Novel style, but their choice of blank pages wasn't ideal for me. The paper was ok, good with fountain pens, but had something weird about it. It was a little toothy for my tastes as well. Read the full review here. Two things kept this edition from being perfect: the colors and the printing on the paper. They used the same gray paper from the Lunacy edition, but then printed white on it, which made any interaction with ink look super weird. The cover colors were a bit bright for a winter release, but we did get another pocket sized datebook out of it. Read the full review here. These were released in January, but had a November 2016 printed-on date in the back covers. This was the second in the LL Bean collaborations, and in my opinion, the better of the two. Read the full review here. Every year, Field Notes makes a Tournament of Books notebook, and every year it's a variation on the theme of the red rooster and kraft Field Notes book. This year was no different. If they weren't sold as singles and as a matched charitable donation, these wouldn't warrant being separated from the "Kraft Collabs" section. These books are close to being a "Kraft Collab" set as well. The only thing special about them is that they did a reverse, and printed brown where kraft usually shows through, and vice-versa. The Ingersoll logo was on the back in white. This look was recreated a bit by the redesigned Pitch Black books, which as duplexed black and kraft, instead of printed that way. Another edition with major corner issues. Read the full review here. The Bellroy books that were included with the Everyday Inspiration cover were exactly the same as the Ingersoll books, except with different logos. I would be pissed if I was either company, to be honest. But Bellroy shouldn't be, as they got a lot of exposure in the Nuts community with this killer cover. I ended up selling mine off, as I realized I'm just not a cover guy. Whoooo boy. Field Notes did 3 different packs with Abercrombie & Fitch, one featuring floral prints from their archives, another featuring hunting imagery from their archives, and a third boring black one with an old A&F logo on it. This is the release that caused all the stir within the stationery community about gendering notebooks. If you take away the issue of Abercrombie & Fitch, these ARE beautiful editions, except for the black one, which is pretty plain. I didn't review these, because I couldn't be unbiased. I loved the look of them, but I and many others expect more out of one of the more revered companies in stationery. These looked really cool, but they weren't something I absolutely had to have and are hard to get a hold of, as they can't just be bought online. Here's a picture from Rhonda Fair. 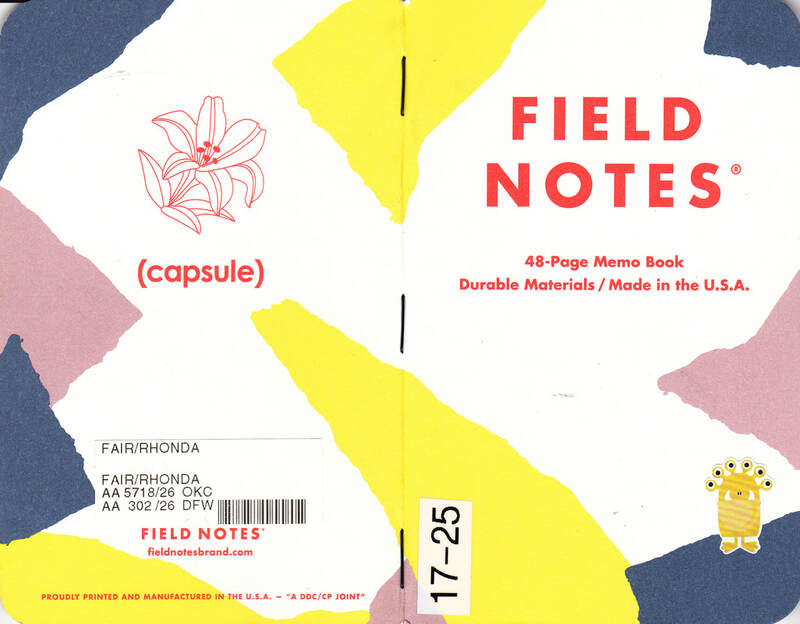 The total Field Notes guide is here and is a great resource. These look like one of the Shenandoah singles to me, and I didn't really feel like paying $17 for them. Another edition I didn't care to try to track down. It's ok looking. These look pretty great. It's nicknamed "Alphabet Soup" because of all the letters. It's a 4-way between Mondo, LandLand, Burlesque Design, and DDC. Some of the Nuttier Nuts have them in their hands from buying them direct, in person, from one of the companies (aka at a Draplin event) but they haven't made a full print run just yet. They're supposed to be sold at each one of the individual websites of the groups involved, but I wouldn't be so sure that each one won't have a different set to sell because beanie baby money grab. Here's Rhonda's picture. As always, there are countless "I bought a bunch of Kraft Field Notes and screen-printed/stamped/embossed my own logo on the back" but I'm not going down that boring rabbit hole. One of the biggest changes this year was to the Pitch Black books. Now they come in two sizes, the pocket size (called Memo Book) and the bigger, Arts & Craft sized (called Note Book). They duplexed the covers, black paper on the outside and Kraft paper on the inside, which I'm not the biggest fan of, because I can't get over the black belt/brown shoes look of the whole thing. Read the full review here. 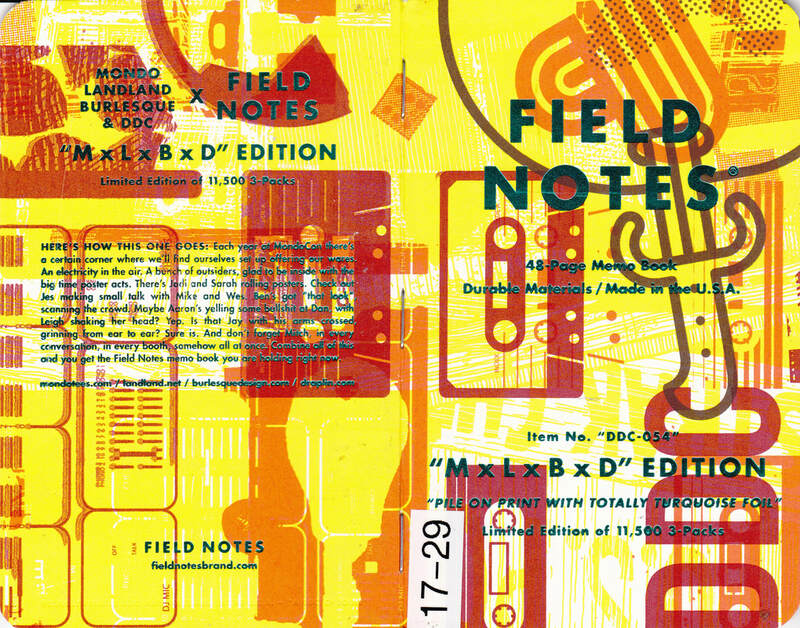 Some reprints of Draplin's earliest Field Notes experiments. I love these, warts and all. They were initially only available to subscribers, but then went on sale, while supplies last. Check out my video here. Meh. Something that lays flat like this can't be "left-handed". You just look at the logo on the back of the book instead of the front. These are really nice. Before, when they would do the "Today Is Wednesday" sale, you'd get a free 3-pack of Pitch Black with any purchase. Now it's these nice robin's egg blue books made special for these Wednesday sales. The only downside is you get 2 books instead of 3. But hey...free! I just got my copies of these and haven't dug in yet. They're a collaboration with artist Jay Ryan. They took a months worth of his Instagram ink drawings and placed them in the book opposite a hand drawn line ruled page. The other book in the set is a blank sketchbook. And glow in the dark covers! Pretty need, but I need to dig in a take a look. Another Bellroy collaboration. It looks neat, but won't hold an unsharpened Blackwing, which for me is the price of entry. It's also $40. They put in 2 pens, 2 pencils, 2 rubber bands and a 1-inch pin, but C'mon...save the Bics and the Dixon Envirostiks and take of $10, will ya? Not for me. I prefer the Write Notepads Pencil Pouch, which at $15 holds more, fits an unsharpened Blackwing, and is just as stable...plus Made in the USA! Overall, not a bad year for Field Notes, though had Campfire not been as awesome as it was, I might've seriously considered not renewing my subscription. But with the price increases that happened this year on everything but the absolute basics, the subscription is that much more of a value.